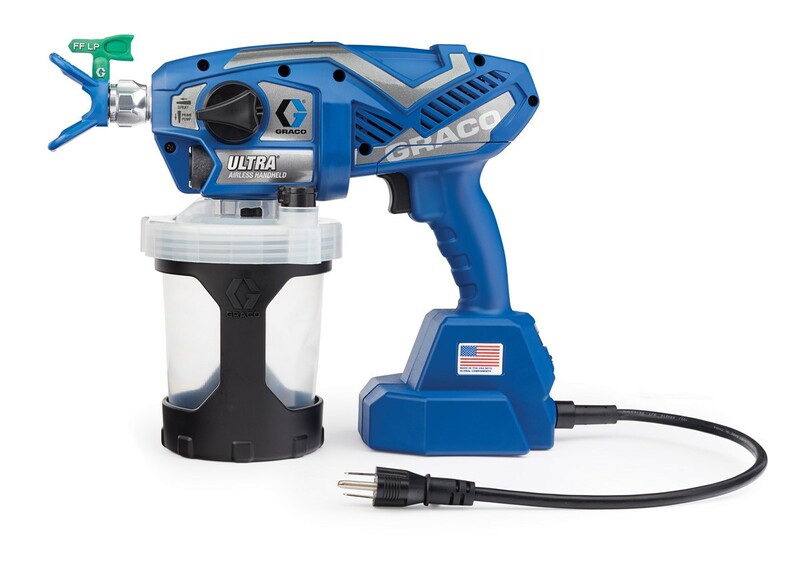 Ultra airless handheld sprayers are designed specifically for small interior, exterior and specialty projects, and the Ultra Corded sprayer is ideal for spraying water-based materials. The true advantages of the Ultra handheld sprayers are the Perfect Airless Finish, ultimate portability on the job, and that it is ready to spray in seconds. Painting contractors can easily spray those small jobs without having to start-up their larger airless sprayer. Reverse-A-Clean (RAC) SwitchTips deliver exceptional spraying results and make clearing tip clogs simple Spray at lower pressure with ANY Graco Sprayer. Durable carbide piston built to deliver extended reliability. 32 oz (0.95 l) FlexLiner All new easy-to-clean design! Disposable liners eliminate clean-up time. Spray in ANY direction – even upside down! Adjust motor speed and flow for TOTAL control with thin and thick materials. Delivers consistent spray fan at all spray pressures.